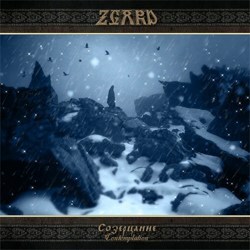 Zgard is the personal atmospheric pagan black metal project of Yaromisl from West Ukraine, who is also a member of the pagan metal band Говерла (Goverla). Zgard were formed in 2010 and have been over-productive, releasing three full-length albums and one split with Prohod since 2012! The band changed 3 labels before signing to Svarga Music in order to release its fourth full-length album “Созерцание – Contemplation“, which will be out on June 23, 2014. During all these years, Yaromisl experimented with various genres within his project Zgard. And while atmospheric black metal is the most dominant of them in his latest works, the band has also many elements of folk, pagan and melodic black metal. Actually all of his albums have different focus on each of these genres. With this new album the band is trying to combine all of these styles and in my opinion it stands as a summary of all their works so far. Their music has a darker epic mood and they sound more raw and powerful. Also I believe that this is for sure the most “black metal” work of the the band. “Contemplation” has a professional production, with a perfectly balanced, clear and rich sound, quite uncommon for most one-man-bands. Guitars sound more dominant and natural than before, synths are still very melodic and atmospheric, while the traditional acoustic folk instruments (sopilka and vargan) sound breathtaking as always. In this album Zgard have done an impressive work with the vocals, sounding more variable than ever. All pagan black metal screams are by the guest vocalist Dusk, whose voice adds an extreme touch in the album, combined with Yaromisl’s wonderful epic clean vocals, choirs and atmospheric spoken parts. The amazing guest female vocals in the album-titled 9-minute atmospheric masterpiece ”Созерцание” is also a very welcome addition. “Contemplation” is a very diverse album, with 7 long compositions lasting for over 62 minutes. They move from atmospheric black metal to epic black metal, pagan folk metal, cold melodic black metal, while there is also a 6-minute instrumental ambient song, entitled “Забуття – Silence“. Most lyrics are in Ukrainian, except for the title track in Russian, dealing with epic nature related themes and Carpathian mysticism. “Contemplation” is a very good album, recommended to fans of atmospheric pagan black metal. I think it’s the most characteristic work of Zgard, since it showcases all their different styles. The album has many great moments and a very beautiful atmosphere. My only concern is that when you move in several styles, some parts sound less interesting, depending to each listener’s preferences. “Contemplation” will be released by the Ukrainian label Svarga Music in two different formats: standard jewel case CD and 6-panel digipak limited to 100 copies, both already available for pre-order. The wonderful artwork is once again by Kogaion Art and the 16-page booklet includes all lyrics with their English translations. You can follow the band’s official profiles below, or visit their label’s page for more details and sound samples.